Different model kayaks are made for different size people. How tall are you and how much do you weigh? These factors will make it easier to recommend a kayak. Thank you for replying! Im 5'7, around 165-170. I was checking out del paddlesports site and besides hobies, they have native kayaks, wilderness systems and i think a few others. Sorry if these are routine questions here, but i just want to buy the right kayak. Would you be using the kayak in the salt or fresh water or a combo of both? How far of a distance do you plan on pedaling on an average trip? How much can you comfortably lift over your head? Would you be transporting with a car or trailer or truck? What kind of a budget are you looking at ? Also keep in mind that you can easily double the amount of money you spend on your kayak when you begin to pick up the accessories. Proper kayak clothes for cold water. Proper racking equipment of your vehicle. 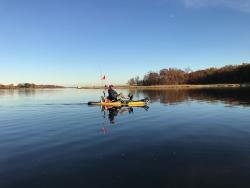 rods, Many people start out with a used kayak and see if they like it before taking the plunge with a new one. Used kayaks hold value better then new. The best advice someone can give you is to go rent a kayak for the day and see if you like. 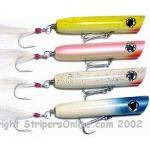 If you do go to a dealer and demo some boats you may be interested in. Also pedal drive kayaks tend to be a bit heavier then paddle kayaks. Make sure you are able to move the kayak around by yourself. Most pedal drive kayaks will weigh more then 100 lbs when loaded with gear. I would say more in the salt. 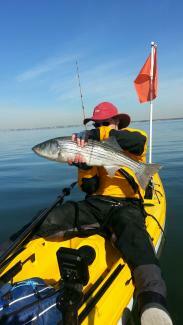 I fish great bay and barnegat bay alot. I would say a decent distance. I ride a bike for exercise on weeknights when its nice out and can ride 15 miles a night. I can comfortably lift 100 pounds over my head, maybe more. I dont know, its been awhile since ive worked out. I live 5-10 mins from a boat ramp so i could launch it really quick and i have a jeep cherokee to transport it. As far as a budget, im open to see what everyone would suggest first. My only experience with a pedal drive is a revo 13. I think that would fit your requirements. if you are lookiing to save some coin. Good luck with your decision. I really do appreciate you taking the time to help me out. I do realize i need all the saftey gear to go along with it. I already have a nice pfd i use when im on my skiff. And yes everything adds up! Its craxy how fast it does too! Thanks againand have a great day! I just bought my 1st peddle yak after paddling for the past 5 years ... chose a Hobie Compass. Got a demo at a really good price. I researched and found I liked the Hobies due to the longevity in the market (basically tried and true), and the Compass due to the simplicity and weight vs the Outback. A bit lighter than a Revo. I am bigger than you, so I was a little bit concerned about stability, even though a number of experienced yakkers here like the Revo a lot. Compass should excel in protected water ... Revo may be better on the open ocean. Highly suggest you look at Craiglist and Facebook for used boats ... Revo can be had for $1500; not a lot of Compass' on the used market due to their newness. what you use for a pfd on your boat may not be comfortable on your kayak but worth a try. Hobies are and have been king of peddle kayaks for a long time so will be hard to compete. That said, there are a lot of new players in the market so may be worth basing it on all other factors and then what you can get for a deal. It is hard spending $2500 or more on a plastic boat. Thank you for the reply. I dont mean those bulky orange ones that come in a pack. I have an inflatable one for when im out alone. I will check out pfds for kayaks though. Im going to start looking on Fb and craigslist too. I just dont want something too big but stability is a concern too. The consensus seems to be distance - open water - go with Hobie mirage drive...very efficient system, tried and true in saltwater. If protected bays - freshwater...the new prop drives deserve a hard look, for instant reverse alone. New Outback looks like a solid platform for the most versatility. Outbacks were always the bestselling Hobies for a reason...it's a good platform for most fishing situations, with maybe the exception of frequent surf launchings. I was just looking at the Revo, and the Compass that you bought just now. The Revo that is 13'5" long and 28.5" w compared to the Conpass at 12' long and 34" wide. That would be more thatble in the bay right? Im definitely not going out into the surf anytime soon until im really comfortable with it first. I plan on fishing the barnegat, and great bay, and backbays and lagoons.